Does your child need extra help with math? It’s time for the abcteach Math Magician! The Math Magician app was created to showcase basic math problems in a fun and interactive way. Math Magician helps students of all ages learn the basics of counting, addition, subtraction, multiplication, division, and greater than/less than values. This app is great because it has multiple levels of computation, allowing individuals to learn at their own pace. Your student will enjoy the app for its creative graphics, intro movie, rewarding treasures, and positive reinforcement; in the process, they will learn how to read and solve multiple choice questions, while working on their mental math skills. This fall, we will be updating the Math Magician app with a new level of difficulty. This level will be pre-K, focusing on beginner level problems. Math Magician will have four different levels of computation, covering six different subject matters, once the update is complete. The pre-K section will be great for youngsters that are just learning about math, as their first impression of math will be fun! Math Magician is available for iPhone 3GS, iPhone 4, iPhone 4S, iPhone 5, iPod touch (3rd, 4th, and 5th generations), and iPad. Requires iOS 4.3 or later. This custom made SMART Board notebook was created to strengthen your students’ understanding of addition and subtraction, using the numbers 2,4,6, and 8. In this interactive lesson, you must drag one of the given numbers into the correct spot in order to complete each math equation. Dragging and dropping numbers to solve problems is a great way to get your student involved in math. This feature helps students recognize numbers, solve problems faster, and creates enhanced memory of the numbers and problems presented. Every problem will use 2,4,6, and 8 as a possible answer for each page of this lesson. This demands that the student make a decision on which number is best suited for each particular problem. 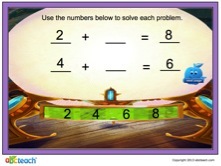 This is another interactive that is a part of the Math Magician SMART Board notebook series. In this activity, your student will learn counting and addition skills. 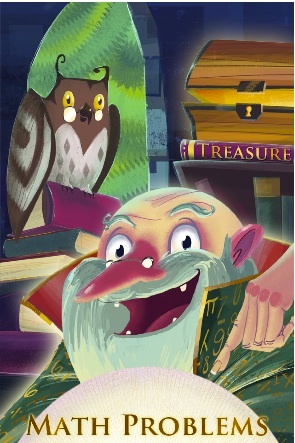 Each student must either drag the given amount of magic treasures into the Ten Frame, or count the treasures in each Ten Frame to get the correct answers. Counting and adding in Ten Frames is an organized way for your child to learn basic numbers in math. We hope you enjoy these lessons and more, as abcteach plans on expanding our Interactive Math Magician series. Simple, to the point, and reinforcing basic math skills is what you will get. Become your own math magician, and conquer these great interactive lessons today! Questions about the Math Magician app or interactives? Please email us at apps@abcteach.com.